A question we get asked frequently from our do-it-yourself customers is which divorce form should I choose? The easiest way to select from the five Florida courts' approved dissolution of marriage forms is to split them into two separate categories. 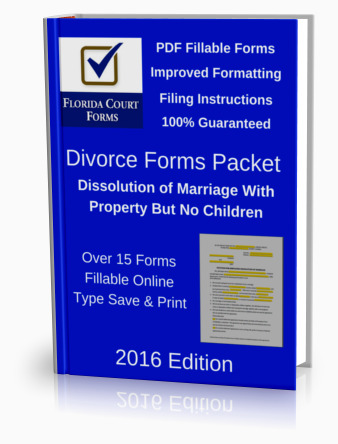 The first forms category is Divorce With Children and the second is Divorce With No Children. Which one of these categories is right for you? Simply decide which category you fall under, children or no children, and then select the right form from the list below. NOTE: Children of the Marriage means any children born to the wife during the marriage even if the husband is not the biological father or they were not living together at the time. NOTE: Property means any assets or debts that need to be divided, assigned, or transferred as part of a Marital Settlement agreement. Florida's Simplified Dissolution of Marriage forms and procedure were published to help pro se spouses with no children that are in agreement with all issues and want a divorce. • You will both attend the Final Hearing and are willing to give up the right to trial and appeal. It is also commonly known as the Florida Uncontested Divorce. In practice, however, for many it is not a viable option because of one or more of the filing requirements for this type of Florida divorce. For instance, the requirement for both parties to be present at the final hearing disqualifies many who would otherwise be eligible to file this Florida divorce form. Or, there may be an issue or two that you have not agreed to and you would like to have it resolved in court. Instead, many decide not to file the Simplified divorce petition and opt to file a regular Divorce With No Children or the Divorce With Property petitions. The Simplified Florida Divorce form is used when the parties do not have dependent or minor children AND all other issues such as property and debts have been agreed upon. This agreement must be included in a Marital Settlement Agreement, form 12.902(f)(3). 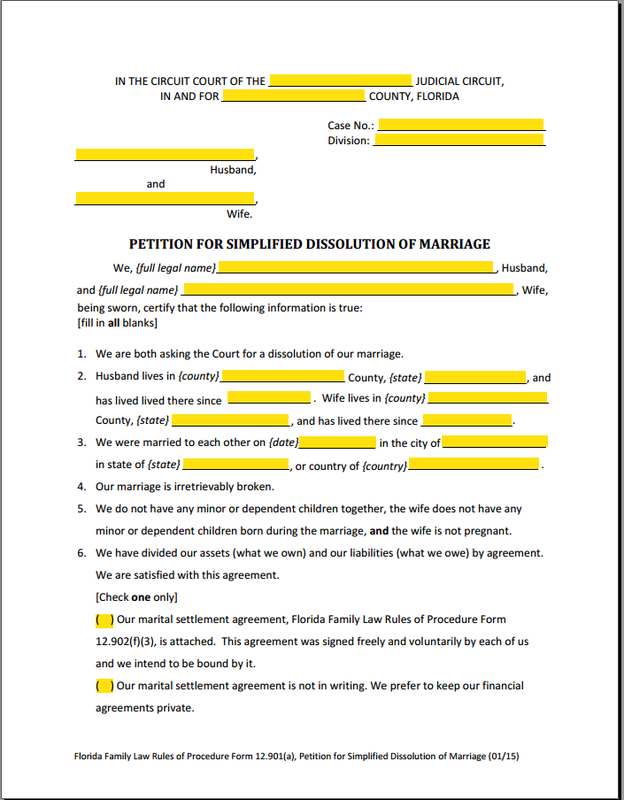 The official name of this form is Petition for Simplified Dissolution of Marriage, Florida Family Law Form 12.901(a). For help with the Simplified Dissolution of Marriage form, click on the pic to the left to visit our step by step instructions page. These pages make it easy to prepare your divorce paperwork online. They include links to all the supporting forms and to the applicable Florida statutes. The Divorce With No Children petition is similar to the Simplified Dissolution of Marriage mentioned above. • Neither of you are asking for alimony. The most important requirements for this Florida divorce form is that there are no minor or dependent children of the marriage, and that there are no assets or liabilities. Unlike the Simplified Divorce, the Petition for Dissolution of Marriage with no Property or Minor Children does not require a Marital Settlement Agreement. Also, there is no requirement that both parties appear together at the clerk's office when filing or at the final hearing. Several accompanying Florida divorce forms are also required to properly file this petition. 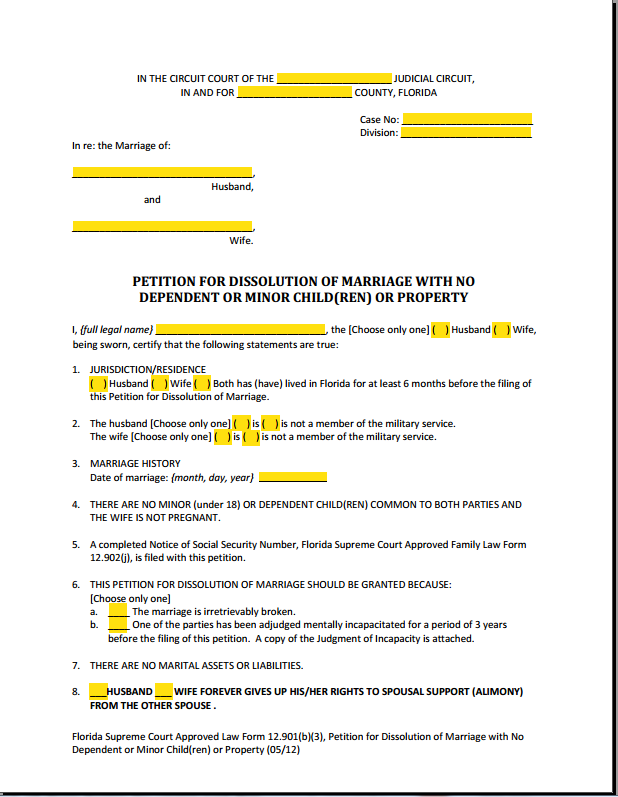 The official name of this Florida divorce form is the Petition for Dissolution of Marriage with No Dependent or Minor Children or Property, Florida Family Law Form 12.901(b)(3). For help with the Divorce with No Children or Property form, click on the pic to the left to visit our step by step instructions page. • One of you is asking for alimony. This is the Florida divorce form for spouses without children but with property and/or liabilities to divide. Some filers who would qualify for the Simplified Divorce but do not want to appear at a Final Hearing together opt for this divorce process instead. If alimony is being sought, or you cannot agree on how to split the marital assets and debts, this form can be used. Also, use this form if one spouse is seeking financial discovery from the other spouse. 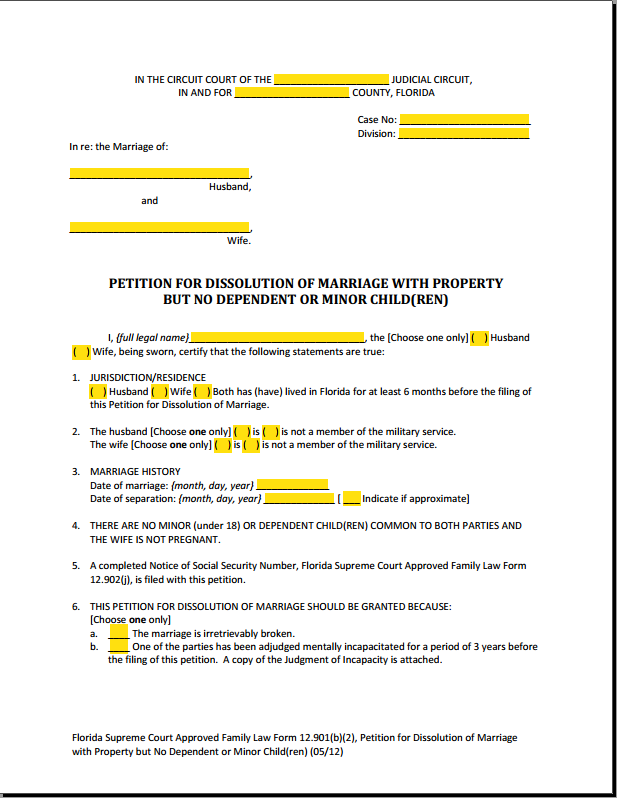 The official name of this Florida divorce form is the Petition for Dissolution of Marriage with Property but No Dependent or Minor Children, Florida Family Law Form 12.901(b)(2). For help with the Dissolution of Marriage with Property form, click on the pic to the left to visit our step by step instructions page. Any divorce that involves minor or dependent children of the marriage or if the wife is currently pregnant requires this Florida divorce form petition. • You have dependent or minor children together or the wife is now pregnant. As you can see, the filing requirements are pretty straightforward. The only exception is when there will be a relocation with the children of more than 50 miles. Note also that it is now mandatory in Florida for the parties to attend a parenting class before the divorce becomes final. 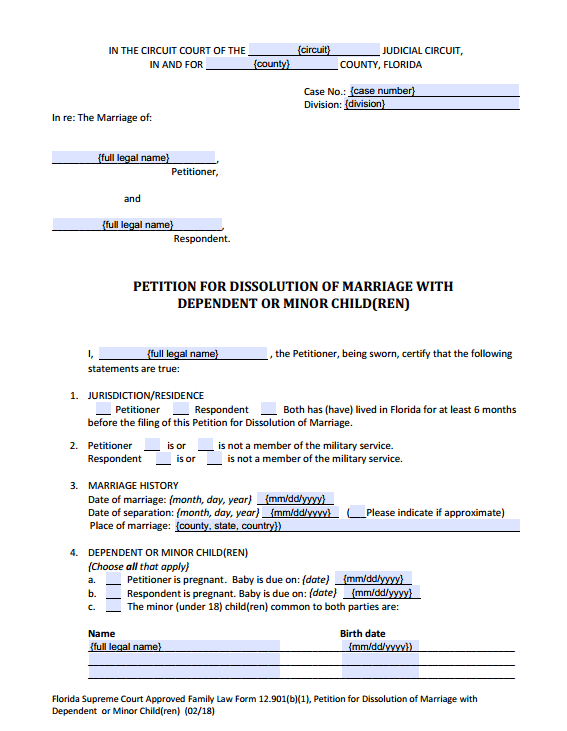 The official name of this Florida divorce form is the Petition for Dissolution of Marriage with Dependent or Minor Children, Florida Family Law Form 12.901(b)(1). For help with the Dissolution of Marriage with Children form, click on the pic to the left to visit our step by step instructions page. 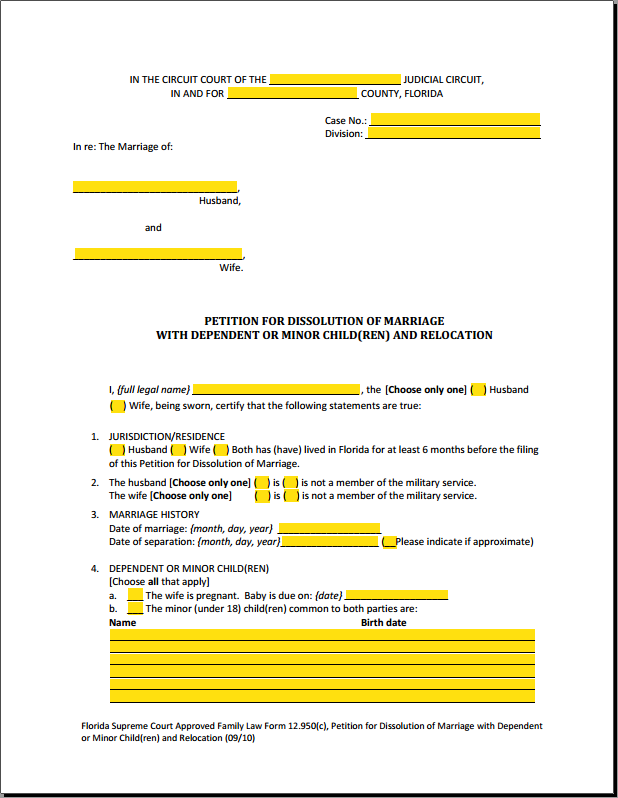 This Florida divorce form is used when your divorce involves minor or dependent children of the marriage and you plan on relocating with the children. 2. The change of location is for at least 60 consecutive days. Additionally, the place you are moving to is more than 50 miles from where you lived at the time of filing for divorce. Also, the at least 60 consecutive days clause does not refer to a temporary absence because of vacation, education, or health care. You can download this divorce form directly from the Florida Courts website. Here is the link. As with the Divorce with Children petition, parenting classes are mandatory before the divorce becomes final. The official name of this Florida divorce form is the Petition for Dissolution of Marriage With Dependent or Minor Children and Relocation, Florida Family Law Form 12.950(c). For help with the Divorce with Children & Relocation form, click on the pic to the left to visit our step by step instructions page.